The Chinese yuan beat the Canadian and Australian dollar to rank as the world’s fifth biggest payment currency since November, but its global market share remain small compared with the US dollar. In December, 2.17 per cent of global payments were denominated in renminbi, right after US dollar, Euro, British pound sterling, and Japanese yen, according to the monthly RMB tracker released by SWIFT on Wednesday. Before November, the yuan had been positioned as the seventh in the currency ranking for nearly a year. Despite the yuan’s robust growth, the US dollar and Euro are still the two dominant currencies in the global payment market, according to the report. The US dollar currently has a 44.64 per cent market share, followed by the Euro with 28.3 per cent, the sterling with 7.92 per cent and the Japanese yen with 2.69 per cent. “The RMB breaking into the top five world payments currencies is an important milestone,” said Wim Raymaekers, Head of Banking Markets at SWIFT. “It is a great testimony to the internationalisation of the RMB and confirms its transition from an “emerging” to a “business as usual” payment currency. The rise of various offshore RMB clearing centres around the world, including eight new agreements signed with the People’s Bank of China in 2014, was an important driver fuelling this growth”. 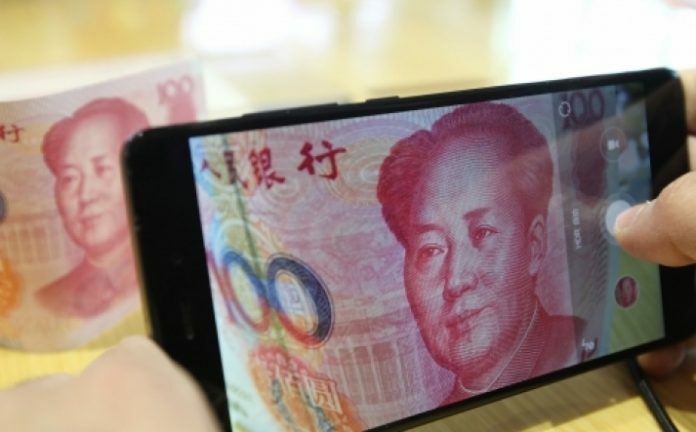 The value of yuan-denominated payments, including customer initiated and institutional payments, jumped by 321 per cent since December 2012, when payment growth denominated in all the other currencies on the top 10 list grew by less than 50 per cent, according to the report. During this period, US dollar-denominated payment values kept growing, while Euro payments value had been trending lower compared with where it stood two years ago. It remains to see whether the yuan could keep its popularity in global trade when the currency has been weakening of late. The onshore renminbi has lost 2.52 per cent while the offshore yuan has lost 2.76 per cent in 2014 against the dollar. Banks including Standard Chartered and HSBC expects the yuan to shed more against the US currency in the first half of 2015 thanks to a stronger greenback and subdued regional trades. China has appointed 15 clearing banks worldwide out of mainland China to promote the popularity of its currency. They include Hong Kong, Macau, Taipei, Singapore, Seoul, London, Paris, Frankfurt, Switzerland, Luxembourg, Malaysia, Bangkok, Sydney, Toronto, and Dubai.